These No Cost, Dinner Conversation Cards are a great way to celebrate being a family. Start them the first day of February and do one card every night for the whole month. What a great way to have fun as a family, get to know each other better, and take a minute to just be silly together for a moment. I had been trying to design my own idea around the theme of creating Valentine Dinner Conversation cards, when in my research I came across this great post! I used their great idea and made my own, using leftover scrap booking and construction paper I had on hand. 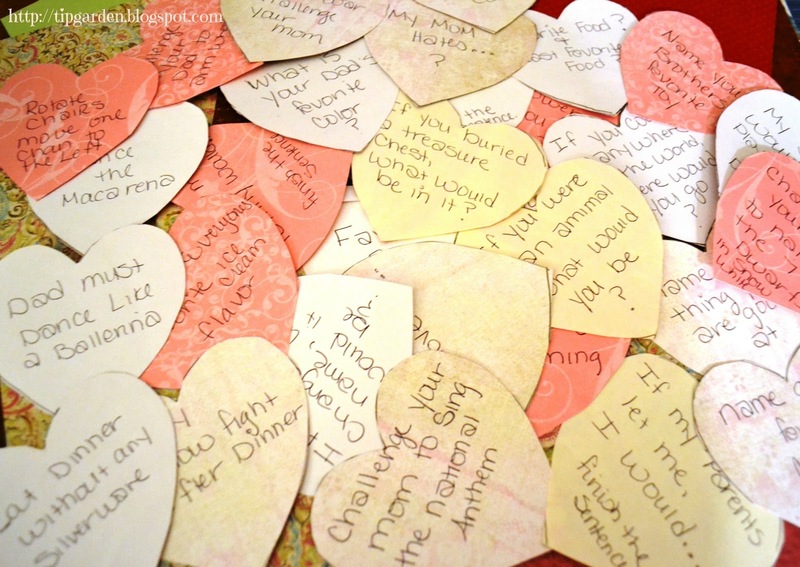 The idea around the dinner conversation hearts is simple, yet easy to adapt for your own family. Whether you pull out one card and everyone answers the question, or only one person per night answers the card is up to you! I loaded mine into a mason jar, and popped in some cotton balls every few hearts, so they won't all sink to the bottom of the jar. I put in around 30 hearts, so there are enough for one per night for the whole month. Cut out 28 hearts and write your questions on the back. 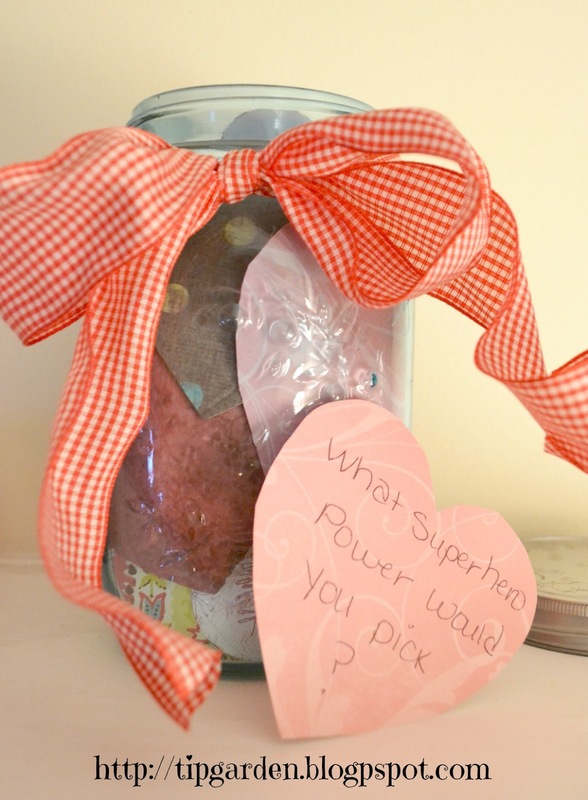 What superhero power would you pick? If you buried a treasure chest, what would be in it? What did your dad wan't to be when he grew up? Name one thing you are good at? Name your Dad's dream car? Sledding or swimming, what would you pick? Name your brother/sisters' favorite toy. My sister would rather: Play Sports or Dance? Challenge your Mom to sing the alphabet backwards. Everyone rotate chairs. Move one chair to the left. Challenge your mom to a thumb war. This is an idea that I'm sure any family could have fun with. 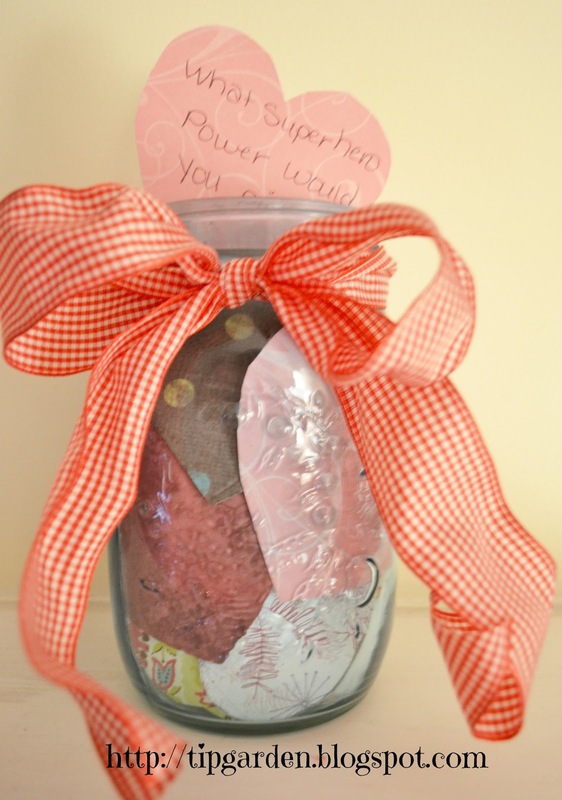 Love your questions.Thank you for linking up with the Spring Craft Blog Hop. Pinned and Tweeted. I love this idea! It's something the whole family could have fun with, even Mom and Dad. Too often the adults try to pry information from the kiddos at dinner without returning any input! So true Renee! My kids do not like to anwser a lot of questions about their day, but if you wrote them as a part of the game, like: What was your least favorite thing today, or funniest thing that happened,etc. everyone can answer.